It's Just Mobolaji | Music & Entertainment: Davido to Release ‘Skelewu’ in The UK + Announces "#CanUSkelewu" Competition with CASH Prize! 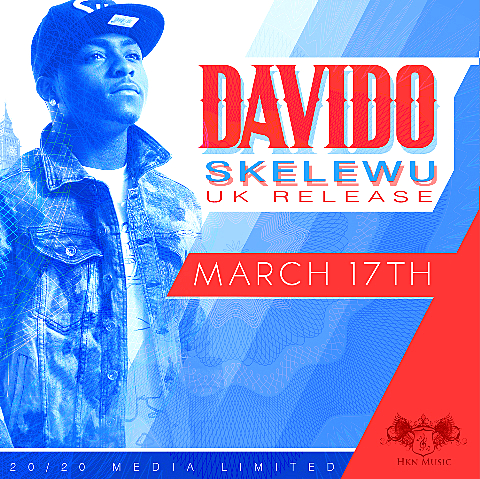 Davido to Release ‘Skelewu’ in The UK + Announces "#CanUSkelewu" Competition with CASH Prize! Just when we thought we couldn't get enough of artist Davido, he announces the official UK release of his huge hit single ‘Skelewu’. The song which fans instantly fell in love with took over the dance floors at clubs, parties, weddings and all the other events you could think of in both Africa and Europe; and has even been a chart topper reaching #1 on the UK club charts. Only 21-years-old, multi-platinum selling artist Davido's infectious single has been co-signed by some of Africa's biggest UK premiership strikers - Emmanuel Adebayor and Samuel Eto'o and will see its release on March 17. In honour of the official single release to keep the momentum going and to gain even more buzz Davido and his team have announced a ‘Skelewu’ competition online called #CanUSkelewu. The rules for the competition are so simple, details as seen below about the competition and the prizes! #Exciting! Think you've got what it takes, then just ask yourself one question. #CanUSkelewu? To celebrate the release there is a competition being run for Davido's fans with big money prizes to be won. A similar competition took place in Africa and was a huge success with hundreds of videos sent in so we have high hopes for similar success here. Upload your videos to YouTube and Instagram and don't forget to hashtag #CanUSkelewu and tag @lifeofdavido on Instagram. Then email your YouTube links to davido@iamdavido.com. Davido will watch every video posted so we want to be seeing some serious shapes being thrown and your best Skelewu.